Crystal knobs bring back that timeless style of yesteryear back to your home. We have many crystal door knobs available from multiple brands. Emtek and Baldwin offer various colors of crystal with multiple backplate styles while Granduer and Nostalgic Warehouse bring back the old school look with taller decorative backplates to replace old vintage door locks. 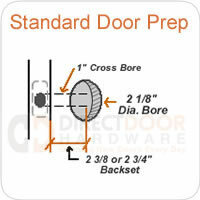 We even have replacement skeleton key locks if you have really old doors and want to keep them of the period. Crystal door knobs are available in many styles and offer a unique beauty you just don't get with standard door knobs. Note: Crystal door knobs are not recommended for use on exterior doors and in fact using them in exterior applications will actually void the warranty with most brands.